Over the past few months Canadians have spent an unusually significant amount of time discussing how our history is told. Following significant cutbacks at our key national historical institutions (Library and Archives Canada, Parks Canada, and the Museum of Civilization) and the announcement of targeted government-led history projects (such as the new Canadian Museum of History and the Standing Committee on Canadian Heritage’s Study of Significant Aspects in Canadian History), the study of our history has re-emerged as a subject for heated debate. Amidst much discussion, historians and politicians have made fairly broad statements about the state of historical research in Canada. 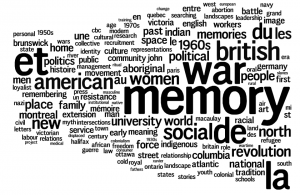 All of which leads to the question: In 2013, what does Canadian history look like? Today, hundreds of historians are descending upon the University of Victoria for the Canadian Historical Association‘s annual meeting (the CHA). This is the pre-eminent gathering of professional historians in the country. Over the next three days, a mix of junior and senior scholars will discuss local and regional issues as well as broader international subjects and more methodological concerns. Historians will celebrate our successes and share new directions in our research. The CHA is perhaps the best place to assess the discipline as a whole. 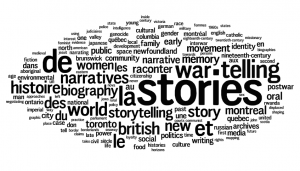 To that end, today I want to ask a few questions: what topics do Canadian historians study? 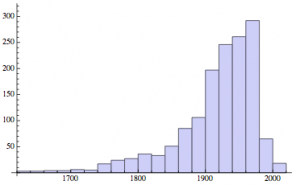 In what time periods are we most interested? How well do we balance issues of region and language? Has Canadian history changed as radically as some of its critics suggest? To answer these questions, I put this year’s CHA program to the test. 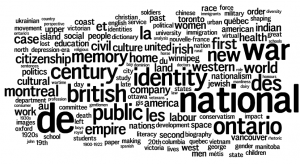 I assembled all the paper titles related to Canadian history (167 titles) and broke the program down into three categories: time period (114 titles), region (97 titles), and language (167 titles). To get at the content of the talks, I used the titles to make a word cloud. I excluded stop words (such as ‘and’, ‘but’ etc…) and words that would distort the analysis (Canada, Canadian, History and Historical). These results are unsurprising. Canadian historians are overwhelmingly interested in topics that follow the year 1830, when Canadian state apparatus really began to develop. The vast majority of papers, however, cover the period after the outbreak of the First World War (most of the 52 papers without explicit reference to their time period focus on the post-war period). Forty percent of the papers address national subjects, while sixty percent have a regional or international focus. In fact, the program is surprisingly well balanced by region, though the Prairies are slightly underrepresented. Also unsurprising in light of the conference venue on the Pacific Coast is that only six papers will be delivered in French. The word cloud gives us some idea of the conference’s overall themes. Key words in the program are British, North, American, Community, Ontario, Politics, Colonial, Rural, War and Borderlands. For readers familiar with the Canadian history canon (old and new), these subjects are not surprising. Nor are other important foci: women, indigenous, governance, development and sovereignty. Significantly given the lack of French in the program, Montreal is the only Canadian city to make the cut. The sample size of this word cloud, however, is relatively small. The most frequent words appear only ten times. 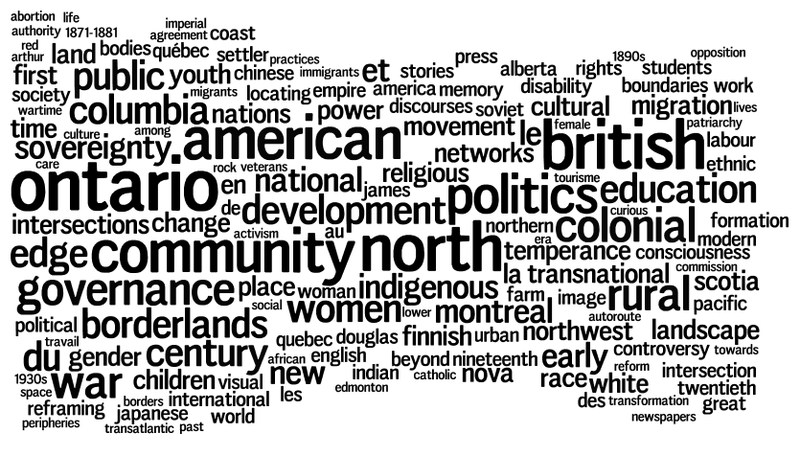 To account for this, I also created a word cloud for the entire program, not just the Canadian history papers. This includes the titles of the poster session and papers that address non-Canadian topics. Adding these titles increased the number of words by 1,000 and gives us a broader sense of what topics historians are studying. The results suggest a slight change in emphasis. The top ten words in this larger sample are: British, war, colonial, politics, American, community, indigenous, north, new and public. Other key words are: Ontario, rural, women, social and the state. Again, these are rather standard topics in the canon of Canadian history. After taking a look at these results, my interest was piqued. So I grabbed copies of the last decade of CHA meetings (all of which are available online) and began turning them into word clouds. I’ve posted the results at the bottom of this post, listing where the CHA was held and the top five words in the cloud. Looking at these images side by side allows us to see some change over time and the variation in conference theme (you can see the program by clicking on the image). Surprisingly, this word cloud doesn’t look all that different than the one from this year’s CHA. War, British, women, public, Ontario and politics dominate in both. 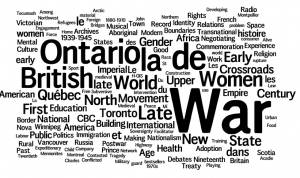 Indeed, if you look at the year-by-year word clouds below, it appears that what has been called the Conservative vision of history (history with a focus on Canada’s military and British heritage), a centre piece of a new warrior nation, has been alive and well during most CHA meetings. Of course, word clouds tell us nothing about the context in which these words are situated. I suspect that this matters. The word ‘war,’ which appears twice as often as any other word except British, tells us little about a paper’s broader context. A title that uses ‘war’ could just as easily focus on the tactical victories of the Canadian Expeditionary Force during the First World War as it could on wartime conditions for women factory workers during World War Two. The former is a relatively stereotypical topic in military history, the latter a stereotype of the potential wartime interests of social and cultural historians. Nonetheless, these word clouds are revealing and shed light on what the so-called ‘history wars‘ were all about. They suggest that although the attention of historians shifted away from political, economic and military interests towards more social and cultural subjects, their broad topical interests remained the same. The Canadian historical community continues to spend considerable energy on questions related to war, empire and politics. Perhaps, it seems, the shift in historiographical emphasis has not been as significant as often made out. The baby may not have been thrown out with the bath water after all. The decade-long data also demonstrates that this year’s conference program is not an anomaly in terms of the time periods in which historians are interested. Canadian history is heavily weighted to the twentieth century. This suggests that there is a structural problem at least within the CHA, but quite possibly more broadly. Put simply, and relatively speaking, there seems to be comparatively little professional interest in Canada’s pre-Confederation history. If our history departments and programs reflect a similar gap in our understanding of the seventeenth, eighteenth and early-nineteenth centuries, then the Canadian historical profession does indeed have a problem in terms of our understanding and teaching of Canada’s past. Much of this resonates with the evidence I drew out in my last blog post about the ‘history wars.’ In that post, I looked at recent publications in Canadian history from the presses at the University of Toronto, McGill-Queen’s and the University of British Columbia as well as last year’s articles in the Canadian Historical Review to suggest that the ‘history wars’ debate actually mischaracterizes the actual work of Canadian historians. The subject matter discussed at the annual meetings of the Canadian Historical Association suggests that this is indeed the case. Yes, there has been substantial historiographical change, but that shift may not have been as marked as often projected. On the whole, the titles of papers delivered at the CHA suggest Canadian historians continue to focus their attention on war, Canada’s relationship to Britain and the twentieth century. I like the direction you are trying to go with the ‘History Wars’ by looking at what historians actually study now. Two of the words in your word cloud might be misleading. Although, there are a number of papers related to the British Empire, does the word British also include regional papers about British Columbia. I also notice that the term becomes more prominent in both 2008 and 2013, the years that the CHA went to the West Coast. Meanwhile, much of our standard terms for periodizing the 20th century use the term war (interwar, post-war, etc). Are these being picked up in your word-cloud and making it look like there is more military history? 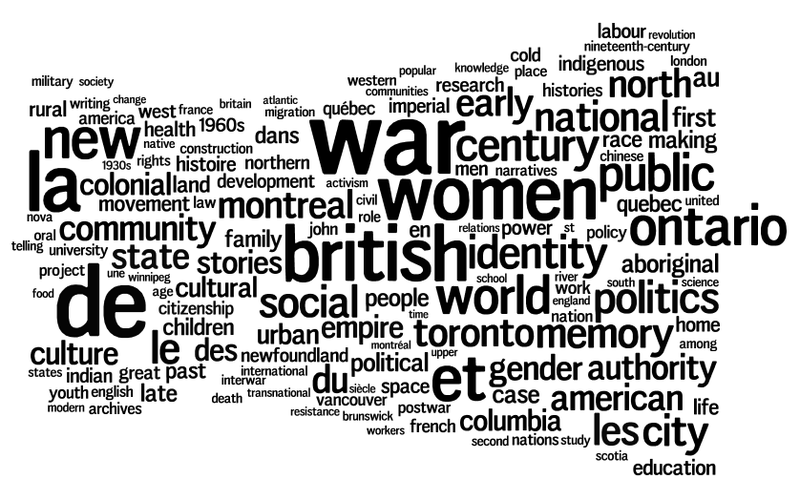 On another note, how different would a word-cloud of the titles of papers from the mid-1960s look? Good points. 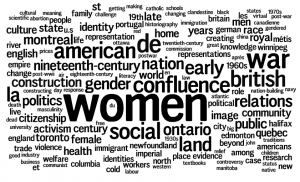 You correctly identify one of the challenges with using word clouds. You’re right about the word ‘British’. My analysis does not adequately account for papers discussing British Columbia. That said, it is important to note that ‘Columbia’ does not appear as frequently as ‘British,’ suggesting that ‘British’ still appears somewhat frequently. For example, I just ran through the numbers again for the decade as a whole: British appears 114 times, Columbia 40 times. This means that ‘British’ appears independantly 74 times and therefore ranks as the fifth most important word in the cloud. I didn’t have time to get into the nuances of textual analysis here. But if you look closely at the word clouds, you will see a number of places where words should be grouped thematically. If I had grouped Indigenous, Aboriginal, Native, and ‘First Nation,’ I suspect I would have had a different outcome. (story, telling, stories, storytelling are another good example from the CHA in 2010). Not grouping words together under represents some topics. If I had grouped ‘colonial’ and ’empire’ together in the decade-long analysis, they would have ranked third between ‘British’ and ‘Women.’ This suggests to me that ‘British’ is not as heavily weighted towards place as you suggest and that my conclusions about the term are close to the mark. Though, of course, a more detailed analysis would flush this out. More work needs to be done on ‘war.’ I didn’t have time to look at the overall context of these words. You may be right that this reflects professional language-use and periodization rather than an explicit focus on war. This in itself is interesting, though. It reflects how the world wars shape the questions historians ask and our broader periodization. There are a few places in this essay where I make assumptions about the subjects one would expect to see in earlier CHAs. It would be very interesting to see the evolution of the CHA over a longer time frame. Unfortunately, the CHA only has online programs dating back to 2000, making this a much more time-consuming project. Thanks for this Tom. I have long been surprised by the lack of pre-Confederation or colonial history at the CHA. Many who come to the CHA and focus on the post-1830 or post-1867 history have also found homes in other historical societies and organizations, which are often organized along more thematic lines. Colonial historians are no different in this regard, finding homes in a number of Canadian, American, and other international organizations. One of the important questions therefore is why don’t pre-Confed or colonial historians appear to see the CHA as one of their many “homes” and when did this begin to manifest in earnest? Another question is related to scale. Since there are far more scholars working on post-Confed topics than pre-Confed, is there actually disproportionate representation? There seems to be, but more data is needed to properly make this assertion. The final issue or question relates to what you mentioned regarding this apparent imbalance as representative, in part, of department faculty complements and the ramifications for teaching the history of Canada. What do pre and post-Confed scholars offer each other by coming together at the CHA? Is there something valuable in bringing these chronologically defined two solitudes together. Or is simply too awkward to ask colonial historians whose work pre-dates the rise of the nation state to engage and integrate into a national organization, that by the very nature of being national, continues to tie into the nation-state in some form or another? Personally, I believe that both pre and post-Confed scholars benefit from getting together and exchanging ideas. For example, I have personally benefitted this year from a number of sessions on borderlands and transnational history, where some of the theoretical and methodological ideas have helped me to think about some of my own work differently. I would also like to think that earlier works regarding transcolonial history can offer new approaches and valuable insights for those who focus on modern transnational history. It is perhaps time to begin a broader discussion about this and the place of pre-Confed or colonial history at the CHA. Great work, Tom. I would normally suggest you strip out the French articles and prepositions (le, la, les, de, en, etc.) from your clouds but at least they remind us that French-language presentations are accepted at the CHA/SHC despite a large majority of English-language presenters. I’m glad that you picked up on the difference in emphasis between pre- and post-Confederation Canadian history. I think that this is an important part of the essay and one that requires additional consideration. 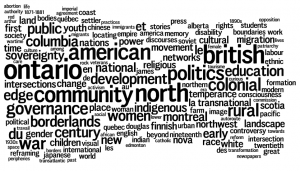 Perhaps more than our post-Confederation colleagues, those of us who research the people and places who lived in spaces that later became Canada, have a broader array of options in terms of our professional definitions and annual scholarly commitments. Yes, many of our post-Confederation colleagues are members of broader thematic associations, etc… but the subject matter of our work can also be conceived quite differently. Rather than defining ourselves as Canadian historians many of us prefer to consider ourselves as historians of Indigenous peoples, of the French or British empires, or even colonial North Americanists (to say nothing of methodological or theoretical approaches). This matters for conferences like the CHA. This year, for example, I chose to attend the Native American and Indigenous Studies Association Conference, held this week, rather than last week’s CHA. Others I know will be attending the annual meeting of the French Colonial Historical Society, which is also being held this week. Unable to be everywhere at once, the discussion about pre-Confederation Canada is perhaps spread across a wider forum (at least at the same time of year as the CHA). The field is also more heavily defined by francophone historians, making the Institut d’histoire de l’Amérique française another popular annual conference for scholars in this field. JC’s comments also fit well here. Although the CHA tries to be a bilingual organization, most papers are delivered in English and the conference is almost always held outside of Quebec. Although the CHA goes to great lengths to maintain a bilingual culture, I understand why francophone scholars may be reluctant to attend. Much of this is hypothesis, but I hope this part of the post will get the ball rolling in terms of a broader consideration of Canada’s pre-Confederation history and how it relates to Canadian history more broadly. There is a lot here to discuss. Allan Greer, “Canadian History: Ancient and Modern,” Canadian Historical Review 77 (December 1996): 575-90. My (admittedly pretty crude) data suggested that work on the pre-Confederation era had declined over the decades and that the emphasis on the contemporary period ran parallel to, but was more pronounced than, similar developments in US history. I agree with you that historians of the colonial and pre-colonial periods have other outlets and connections that may provide a more comfortable fit than the CHA. Many of us who were originally trained in a field called “Canadian History” that then encompassed at least four centuries, now find ourselves talking to Early Americanists, Atlanticists, historians of aboriginal North America, etc. Fine for us, but where does that leave the Canadian field? Is there a danger that the history of Canada will begin and end in taken-for-granted modern context, with a liberal state, a largely industrial economy and with little sense of pre-modern antecedents and points of contrast? Very interesting article! I did observe that the mandated themes of each conference: memory, confluence, identity; for example, appear clearly in the word clouds for the year. It does demonstrate that CHA presenters give it the old college try in attempting to follow the themes from year to year. You might be interested in picking this up in your analysis. I’m writing a paper on the decision to convert the CMC by this government…and about our history and this article, there is no mention of peace here. It is significant to us, and I wonder why it is a non-event here. 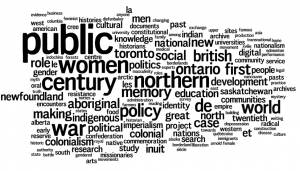 Pingback: What does Canadian History Look Like? CANADIANS HISTORY are from social studies geography everywhere else was CANADA country at late 18th century?